© 2014 Cherian Mathew, Anton Güntsch, Matthias Obst, Saverio Vicario, Robert Haines, Alan R. Williams, Yde de Jong, Carole Goble. The compilation and cleaning of data needed for analyses and prediction of species distributions is a time consuming process requiring a solid understanding of data formats and service APIs provided by biodiversity informatics infrastructures. 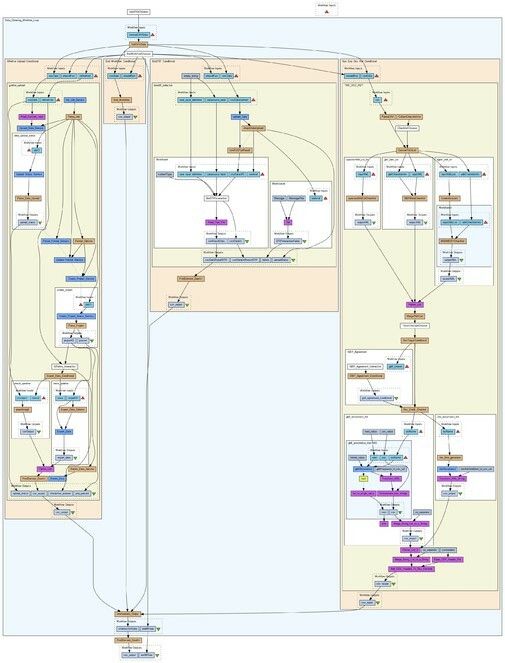 We designed and implemented a Taverna-based Data Refinement Workflow which integrates taxonomic data retrieval, data cleaning, and data selection into a consistent, standards-based, and effective system hiding the complexity of underlying service infrastructures. The workflow can be freely used both locally and through a web-portal which does not require additional software installations by users. Over the last decade, the international biodiversity informatics community has built service-oriented infrastructures that provide constantly updated datasets and computational services supporting the mobilisation (data gathering), compilation (data structuring), contextualization (data standardisation based, for example, on TDWG Biodiversity Information Standards, www.tdwg.org), integration and validation (data cleaning) of species-related occurrence information (Berendsohn et al. 2011). However, these services are not generally used by scientists who in most cases still prefer to prepare their datasets manually, using spreadsheets or their own (local) databases. Although infrastructures such as GBIF (www.gbif.org) and BioCASE (www.biocase.org) offer consistent interfaces to many distributed occurrence and taxon-level datasets, a substantial part of the data resources required for scientific experiments are not organized in, or connected to, such global systems and instead provide separate, inaccessible, and incompatible interfaces and data formats. In addition, software tools and services for data enrichment and quality control are likewise diverse and there is no comprehensive registry available for scientists to discover and deploy services that access and integrate relevant biodiversity data over large taxonomic, spatial, and temporal scales. A range of data services and tools have been developed to address data aggregation, cleaning and curation aspects such as Kurator (Dou et al. 2012) and data quality control mechanisms in EurOBIS (www.eurobis.org). Here we present an approach to improve the effectiveness of species occurrence data compilation using scientific workflows implemented with the Taverna Workflow Management System (Wolstencroft et al. 2013). We designed and implemented a Taxonomic Data Refinement Workflow that integrates services needed for occurrence retrieval, enrichment, cleaning, refinement, and filtering of taxonomic data. The workflow is designed to support scientists in performing interdisciplinary and complex analytical tasks, arising from the combination of disparate services, both local and remote, each with their own input parameters and output formats. In this design each workflow element represents a specific service, with its own input and output ports, which in turn plugs in to other elements. This modular construction allows software developers to build complex analytical processes by successively composing and testing individual sections, which are subsequently added to the workflow. The obvious advantage is that users can concentrate on their own domain (e.g. taxonomy, ecology) without being exposed to the specific technical requirements of all the domains that are a part of the workflow (e.g. service interface specifications, GIS input requirements). Taxonomic Data Refinement Workflow. Schematic diagram showing the integrated functions. Intermediate output from each section of the workflow can be stored and re-used as input for subsequent iterations. 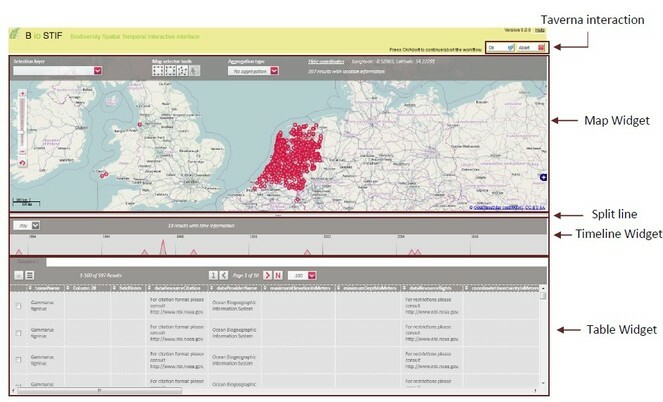 Geo-Temporal Data Selection: Users filter records in time and space using the BioSTIF system (https://wiki.biovel.eu/display/doc/BioSTIF+User+Manual) which offers an interactive GIS-like interface for selecting records by drawing polygons on a map and by defining time slices (Fig. 4). Taxonomic Name Resolution. 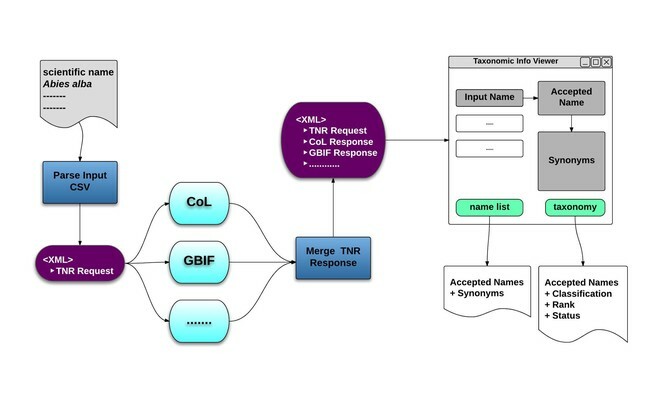 Overview of the Name Resolution function of the Taxonomic Data Refinement Workflow, depicting the aggregation of scientific name responses from the various checklist into a single XML message. This message is then used to display the results within a web interface. OpenRefine interface with the BioVeL extension. The extension adds biodiversity data specific functionality to OpenRefine for the purposes of data cleaning, integration, and refinement. The GoogleRefine branding in the screenshot is due to the fact this workflow uses the last stable released version (2.5) of OpenRefine when the software was still being developed by Google. BioSTIF web interface. The interface allows users to filter species occurrence points based on selected geographical regions and time periods. 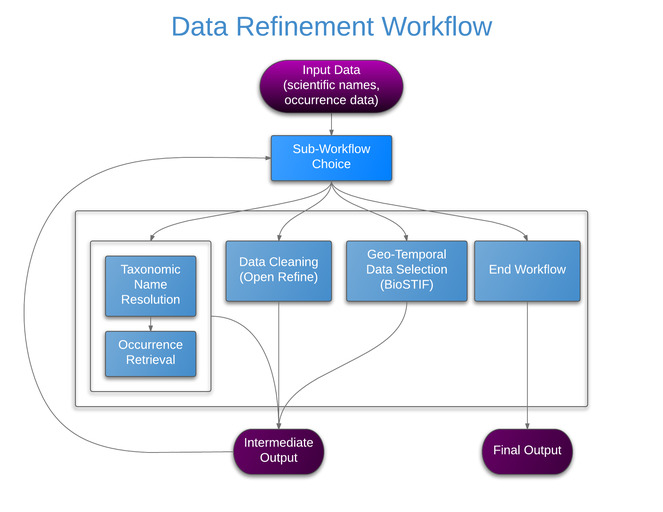 Data Refinement Workflow. Birds eye overview of service interactions of the workflow as shown in Taverna Workbench. Selection of targeted checklists (as controlled taxonomic vocabularies) in the name resolution process. Inputs and outputs of each section are compatible and users may execute sections in any order and as many times as needed, with the option to end the workflow at any point. Traditionally, workflows are used for automating complex or large-scale data processing tasks, often requiring systematic and multiple analyses over sets of data or parameters. However, the power of the Taxonomic Data Refinement Workflow lies in its flexible access to highly specialized and distributed services without exposing the computational protocols needed to interact with them; and the structuring of the studies into a systematic protocol whose results can be compared, its process documented and the source of the results logged. The seamless integration of these service functions enables scientists to inspect large biodiversity data sets simultaneously from different angles (e.g. 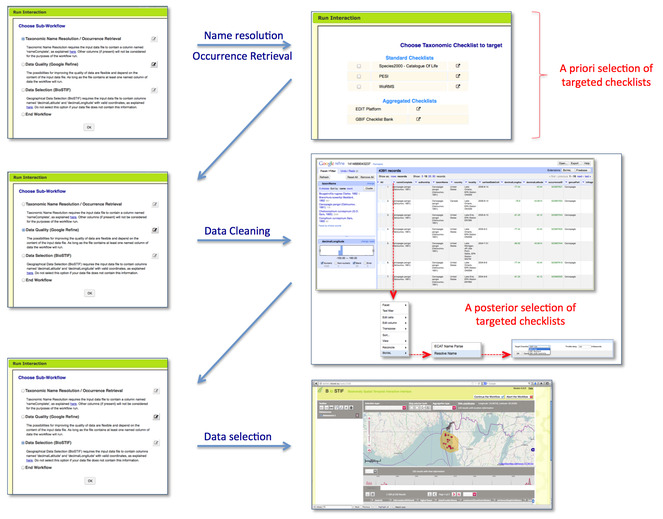 taxonomic, geographic, ecological), and this integrated view allows for appropriate data selection that leads to the generation of comparable data sets. The workflow has been constructed using Taverna Workbench (http://www.taverna.org.uk/download/workbench/) by progressively building each section using individual modules called ‘services’. A number of frequently used services are already available within the workbench environment and developers are encouraged to build their own specific services using Beanshell scripting (http://jcp.org/en/jsr/detail?id=274). This allows for the creation of complex analysis pipelines connecting various local and remote services and nested workflows. Once constructed, the workflows are reusable executable biodiversity informatics protocols that can be shared, reused and repurposed. One of the main features of the workflow is the web browser-based interaction inspired by the development of the Interaction plugin (http://www.taverna.org.uk/documentation/taverna-2-x/interaction) for the Taverna environment. The browser-based approach opens up the possibility of running the workflow on Taverna Player (http://www.taverna.org.uk/documentation/taverna-2-x/taverna-player), a remote execution environment with web-based interactions, which eliminates the requirement to download and install any local software components. This implies that the workflow can be executed both locally and within a remote server environment. Converting the conceptual idea of the workflow into an automated form has revealed the complexity inherent in combining various kinds of services, both local and remote, each with their own input parameters and output formats. (Fig. 5). Each element represents a specific service, with its own input and output ports, which in turn plug in to other elements. The ability to build workflows by connecting together compatible elements allows software developers to construct the workflow by building and testing individual sections, before integrating them into the final workflow. This modular nature of the development process is also beneficial when considering that such workflows are usually built in close collaboration with scientists. This methodology encourages an agile working environment where scientists can easily test and provide feedback on individual components, which are then used by the developers to further enhance the workflow. a set of occurrence observation records comprising both TaxonName and TaxonOccurrence information. The decision to support only the CSV format with a restricted set of header terms has kept the development effort focused on quickly adding various functionality to the workflow rather than making the workflow compatible with different types of existing input formats and vocabularies. This decision implies that the input data preparation for the workflow needs to be done by the user. However, by keeping the format simple and limiting the number of terms, manual intervention is minimized. Future versions of the workflow will support additional data input formats, which can be transformed into a normalized format using transformation software such as Pentaho Kettle (http://sourceforge.net/projects/pentaho/). Pan-European Species directories Infrastructure (PESI, http://www.eu-nomen.eu/portal/). with more planned for the future. The response from each of these web service calls is converted to XML form and appended to the corresponding request. The final representation can be then visualized in a viewer, which displays the relationship between names and their corresponding taxonomic concepts, with the possibility of extracting specific information. Currently the options include the generation of a de-duplicated list of accepted names and their synonyms as well as a list of accepted names along with corresponding taxonomic information. The option to retrieve occurrence records of species obtained as a result of name resolution is also provided within this section of the workflow. Currently the only target is the GBIF Occurrence API (http://www.gbif.org/occurrence), which provides a single access point to more than 500 million distributed occurrence records. Additional targets, equipped with a standardized service interface, can be included as per requirements. This workflow section provides an interface for functionality related to taxonomic data aggregation and this aspect can be greatly improved in the future. For instance, the name resolution section works only with exact name matches and does not provide any kind of reconciliation feature which most experts may consider as a crucial requirement. Another feature that would make the workflow more efficient is to expose specific data provider options to the user, e.g. allowing the user to select geographical bounds to the occurrence data requested from providers like GBIF which offer this kind of capability. Data Quality Checks: This includes a global quality check on specific elements of the dataset (e.g. validity of latitude / longitude values, date validation, etc). Data Transformation: This set of features allow for the conversion of data into a form which is fit for purpose (e.g clustering scientific names using name parsers, conversion of data units, etc.). Data Extension: This category of features makes it possible to enrich existing data by using local and remote services (e.g. resolving scientific names to their accepted names, reverse geo-referencing, etc.). Geo-Spatial / Temporal Data Selection: This section of the workflow deals with the selection of data based on geographical regions as well as the filtering of records with respect to time-based information. The selection is performed using the geo-server based, web-enabled, GIS application BioSTIF (www.biodiversitycatalogue.org/services/7). The tool allows the user to filter in/out occurrence data points by constructing polygonal regions using the given toolbox. A temporal range can also be selected by using the timeline tool to choose a specific period of interest. Along with these functionalities the tool also provides a tabular view of the data. Laugen et al (In Review) The Pacific Oyster (Crassostrea gigas) invasion in Scandinavian coastal waters in a changing climate: impact on local ecosystem services. In Biological Invasions in Aquatic and Terrestrial Systems: Biogeography, Ecological Impacts, Predictions, and Management. De Gruyter, Warsaw. Leidenberger S, Obst M, Kulawik R, Stelzer K, Heyer K, Hardisty A, Bourlat SJ (In Review) Evaluating the potential of ecological niche modelling as a component in invasive species risk assessments. Ecological Applications. The full workflow documentation (Data Refinement Workflow v.13) as well as an extensive tutorial is available at https://wiki.biovel.eu/display/doc/Data+Refinement+Workflow. The workflow can be downloaded from myExperiment under http://www.myexperiment.org/workflows/2874/versions/16.html, and executed through the BioVeL portal under http://portal.biovel.eu. Web-service documentations are accessible from the BiodiversityCatalogue (https://www.biodiversitycatalogue.org/). The Data Refinement Workflow presented in this paper is a generic approach to provide tools to end users working with biodiversity data. The solution presented here has been developed as an automated workflow and tackles problems related to the aggregation, cleaning and geo-temporal selection of data. Even though such tools have been traditionally developed by data service providers, in most cases these can be applied only to data specific to the providers. The DRW aims to enable users to aggregate and normalise data from various sources and then work on making the data fit-for-purpose for a target research use case. The development of such kinds of workflows to be used in conducting in-silico experiments has exposed a number of technical issues. Firstly, it is becoming increasingly clear that a certain level of software expertise is required to develop automated workflows and efforts should be made to ease the technical burden on users (primarily scientists) who may not be so proficient in software development. For example, in its current form the Data Refinement Workflow restricts input data to the CSV format using controlled vocabularies, but should definitely allow for other formats (e.g. TSV, XML, etc) if the workflow approach is to be widely adopted. The workflow has already been used in scientific research use cases which have greatly benefited from the use of the functionality and the efficiency provided by the workflow approach. Future work should include studies to quantify the level of benefit for the users and consider benchmarking the workflow approach as a whole and individual components in particular using well described metrics, which allow for a more objective view on how the DRW compares to other existing tools. The design and implementation of the Data Refinement Workflow was funded by the EU’s Seventh Framework Program project BioVeL (www.biovel.eu) with the grant no. 283359. Cherian Mathew and Anton Güntsch designed and implemented the workflow. Matthias Obst and Yde de Jong contributed specifications based on real-world scientific applications and conducted several tutorial workshops for scientists. Robert Haines, Alan Williams and Carole Goble designed and built the workflow execution environment. All authors contributed to the preparation of the manuscript. Berendsohn WG (2010) Devising the EDIT Platform for Cybertaxonomy. In: Nimis PL, Vignes Lebbe R (Eds) Tools for identifying biodiversity: progress and problems. 1-6 pp. [ISBN 978-88-8303-295-0]. Güntsch A, Hoffmann N, Kelbert P, Berendsohn WG (2009) Effectively searching specimen and observation data with TOQE, the Thesaurus optimized Query Expander. Biodiversity Informatics 6: 53‑58.